A gadget smaller than your phone will analyze the ingredients of your food and report the results to your iPhone or Android device instantly. We know this for a fact that science-fiction writers often predict technological advancements of humanity. Jules Verne, Stanislaw Lem, Gene Roddenberry were fantasizing about people landing on the moon, or talking via huge screens that combined video and sound, or talking to their wristwatch and watching digital contents through glasses. In the meantime, these fantasies come true, and TellSpec is another such technological advancement that brings us closer to the high-tech future we observe in the movies. This little gadget allows you to simply wave it in front of your meal and receive information about its contents instantly on your Android smartphone, tablet or your iPhone. Undoubtedly, this is a futuristic device, and it was inspired, developed and created by a concerned parent whose daughter developed a difficult to diagnose illness. Isabel Hoffmann is the creator of TellSpec, a digital food spectrometer. Hoffman’s daughter developed a confusing illness which eventually turned out to be a reaction to mold in the house. However, it took the doctors more than a year to establish the accurate diagnosis. In the meantime, the teenager developed an allergic reaction to certain foods. The family even had to change the house and adjust the daughter’s diet to avoid aggressive ingredients. 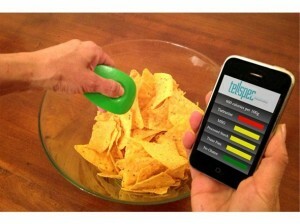 Sometimes, it was difficult to analyze what ingredients would cause the reaction which eventually prompted the mother to initiate the research and development of the handheld gadget capable of analyzing contents of the food and displaying instant results in a simple and understandable manner. 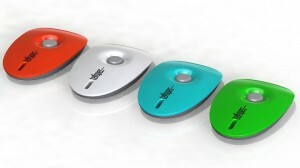 This little handy tool will appeal to a wide variety of customers because nowadays almost anyone suffers from food allergies to a certain extent. Are you allergic to nuts? Are you gluten- or lactose- intolerant? Are you concerned about pesticides in fruits and veggies you serve to your children? Is your diet calories-sensitive? Are those M&M’s safe for your children? 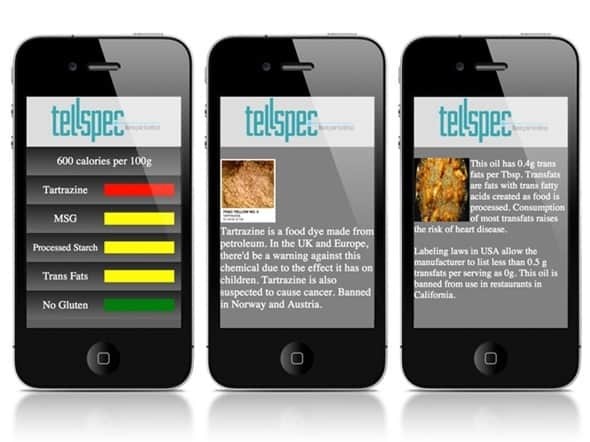 TellSpec will tell you exactly what you and your children are eating. Unsurprisingly, TellSpec can also identify mold, which is especially useful to anyone living in conditions of high humidity, or old buildings. This tool helps people understand their diets and their environments better, and the way they affect the body. The spectrometer parses the ingredients of anything you point it at, and beams the report to its corresponding smartphone application. Pure science combined with a parent’s love created a unique device that may revolutionize our eating habits and the way we treat our dwellings. Sometimes, we are too reckless about what we eat because we are ignorant. Scanning your meals with TellSpec uncovers hidden ingredients that sometimes manufacturers do not reveal, thus tipping you off from hazardous products. It is amazing how simple mold can create aggressive allergic reactions to regular foods, as well as cause Chronic Fatigue Syndrome or Fibromyalgia. So many people suffer from it without even knowing what causes the chronic feeling of always being tired, or why their children’s grades are low. TellSpec will tell you what is in the air you breathe. TellSpec sought its funding on Indiegogo and it currently exceeds its $100,000 goal by collecting twice as much. There are other spectrometers on the market, but TellSpec combines mathematical algorithms to interpret what it scans. When TellSpec beams its laser at the food, the low energy photons come back to the spectrometer, which then analyzes the photons by wavelength, determining chemical ingredients within. We expect to see the gadget on sale in August 2014. It won’t be the cheapest kid on the block, with the initial price of $350-400. Hoffman hopes that, in a few years, they will be able to decrease the price to as much as $50 due to high demand on the market. The developers are building up a massive database of food ingredients that could be hazardous. Hoffman says TellSpec will be able to forecast potential epidemics, such as Salmonella or Mad Cow Disease, when people would log their symptoms in real time, and all the devices within the certain radius will perceive that information and warn their users about something that’s in the local food or water. Also, TellSpec has on its agenda the microscopic bacteria and viruses scanning which will make it a global health gadget. Currently, the tool does not scan for every single ingredient in the food; it only checks for potentially or seriously hazardous ingredients. Clearly, Hoffman aims at “a greener world with healthier people. We really have to stop this massive genocide, these chemicals being put in our food and our environment,” she says. TellSpec has the potential to significantly improve the healthcare system worldwide. As humane and noble as this mission is, TellSpec is unlikely to be available to third world countries where most people are unable to afford the device at its initial price, making it a privilege of the wealthy folk.